The British-designed Firefly Sherman tank employed a 17 pounder anti-tank gun capable of destroying heavily armored German tanks such as the Tiger and Panther. This 1/48 scale assembly kit realistically replicates the long barreled gun and counter-weight at rear of the turret. Display with 1/48 British tank crew and infantry also available from Tamiya. Combine with the 1/ 48 Universal Carrier and Cromwell Mk. IV Tank for an impressive diorama of British armored vehicles. As Britain struggled to develop tanks capable of equaling the superior German Panzers, the decision was made to convert existing stocks of M4 Sherman tanks, delivered to the UK as part of the Lend-Lease Act. The so-called Sherman Firefly featured a long-barreled 17 pdr. anti-tank gun, that was much more effective than the original 75mm gun, capable of penetrating a Tiger I's frontal armor at over 1,000 meters using regular ammunition. The majority of Fireflies were adapted from M4A4 tanks, designated Sherman V by the British, while some were made using the earlier M4, or Sherman I in British usage. Vehicles rearmed with a 17 pdr. gun were given the suffix C, with the resulting units being Sherman VC and Sherman IC. 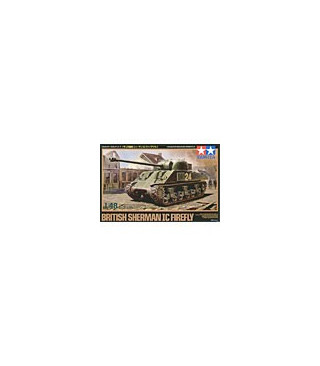 * Detailed 1/48 assembly model kit of the British Sherman IC Firefly. * Features both hull-mounted and separately molded tools and accessories. * New parts accurately depict sharp nose type gear housings at hull front. * Assembly type tracks with straight parts made of single pieces. * Die-cast hull adds weight and realism.